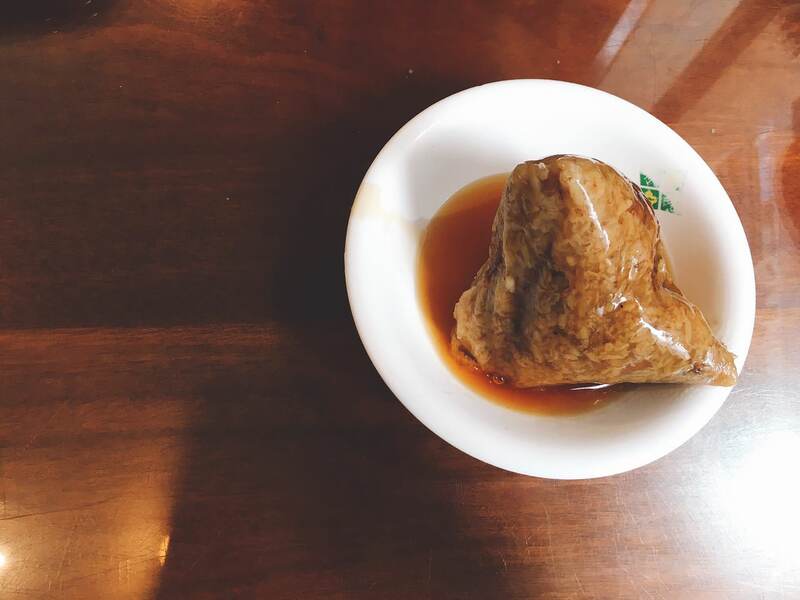 In Taipei City, rice dumplings always appear everywhere, not only during the Dragon Boat Festival. 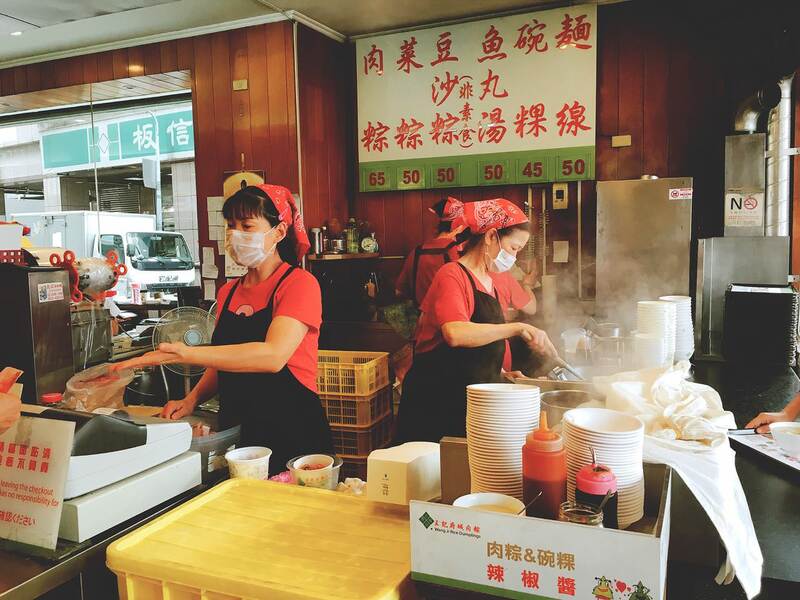 In “Wang Ji Rice Dumplings”, you can enjoy just one rice dumpling just for the fun of it! 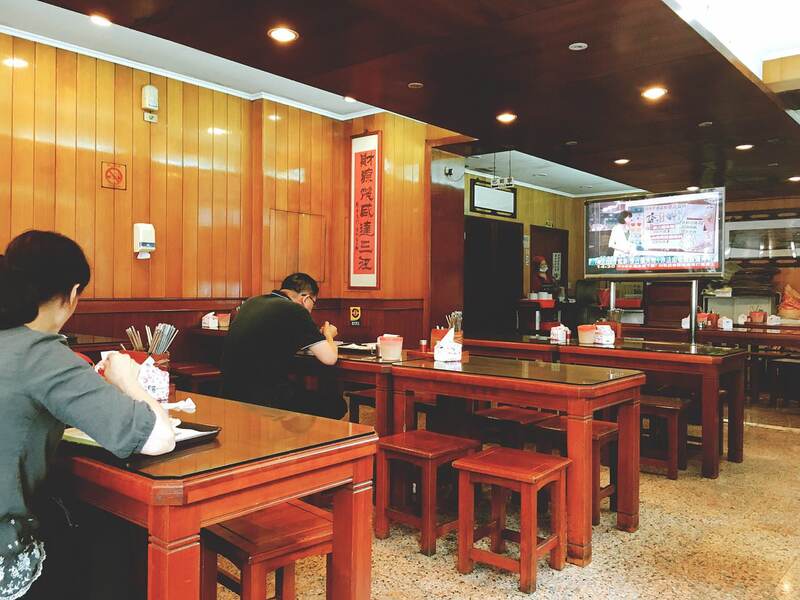 “王記府城肉粽“店名顧名思義是販售南部粽, “北蒸南煮”則是地區性的不同煮法. 整顆肉粽Size不大, 一度認為可能會吃不飽, 最外層的軟糯米黏度極高, 首先吃到的內餡是滷得透徹的瘦豬肉與肥豬肉切塊, 肥肉並不如預期的多, 但油脂足夠讓整顆粽子充滿肉香味. 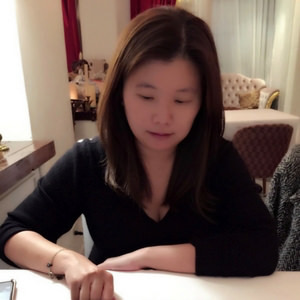 與市面上販售粽子裡不同,“王記府城肉粽“內餡裡的香菇帶有點肉汁且軟嫩, 綿密的蛋黃不會過鹹,整顆完整的栗子與少數花生粒帶來不同微硬的口感. This restaurant only sells Southern Taiwan Style Rice Dumplings, which is wrapped in Bamboo leafs and boiled with water. 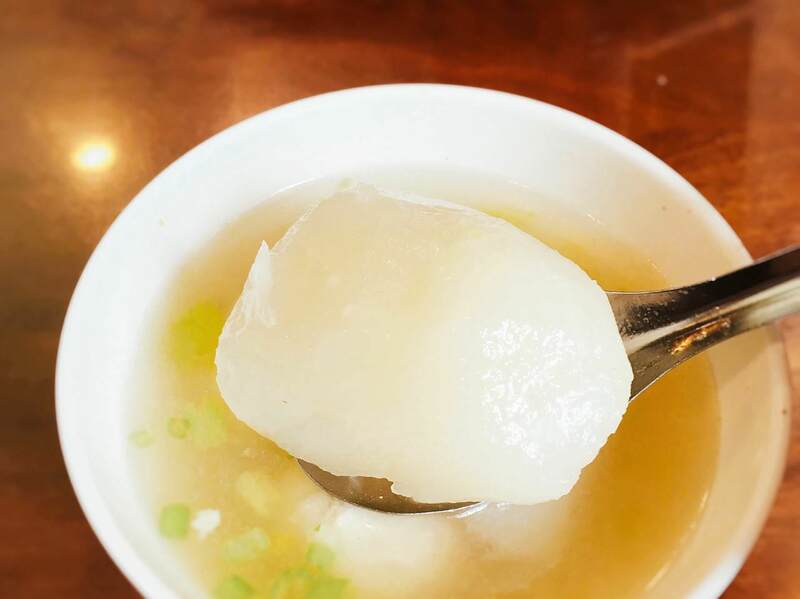 Northern style is more focus in steamed the rice dumplings. The rice is sticky as expected. 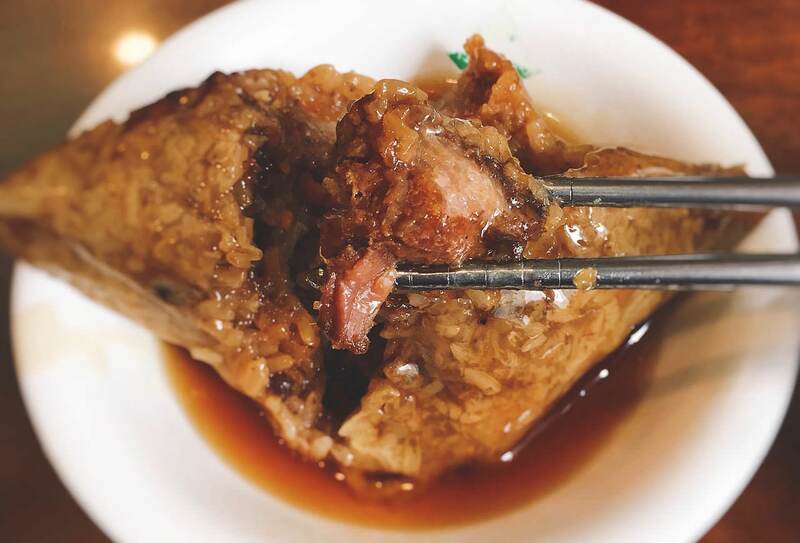 One of the main fillings, the chopped braised porks, are succulent with meaty aroma. 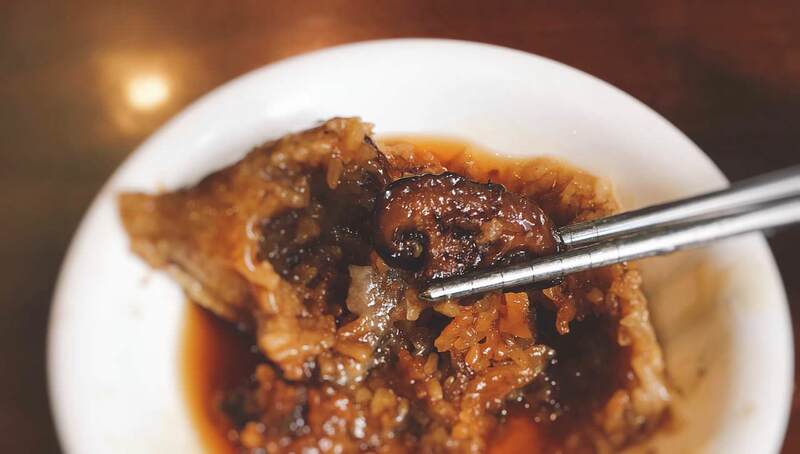 Unlike other rice dumplings on the market, their black mushroom has soft texture and a bit juicy. The cooked egg yolk is creamy but not mushy. One whole chestnut and several tiny peanuts would bring different texture to this dish. 對我來說 , 這碗湯的重點其實是白蘿蔔. 豪邁的蘿蔔切塊煮得透撤但不會過軟, 咬下一口時味蕾可感受少許甜味, 搭配扎實帶有點嚼勁的魚肉丸, 微香獨特的芹菜香讓整碗湯成為這家店的銷售第二名產品. My personal opinion is that radish is the main character in this dish. Perfectly cooked chunk radish is soft in texture. 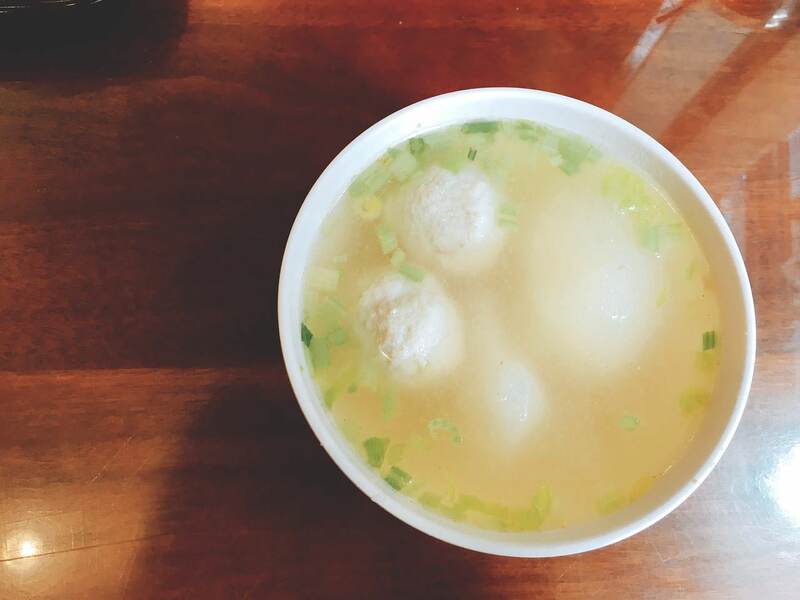 It absorbs large amount of the fish ball soup. When you take the first bite at the radish, there is hints of sweet from the radish appears in the mouth. 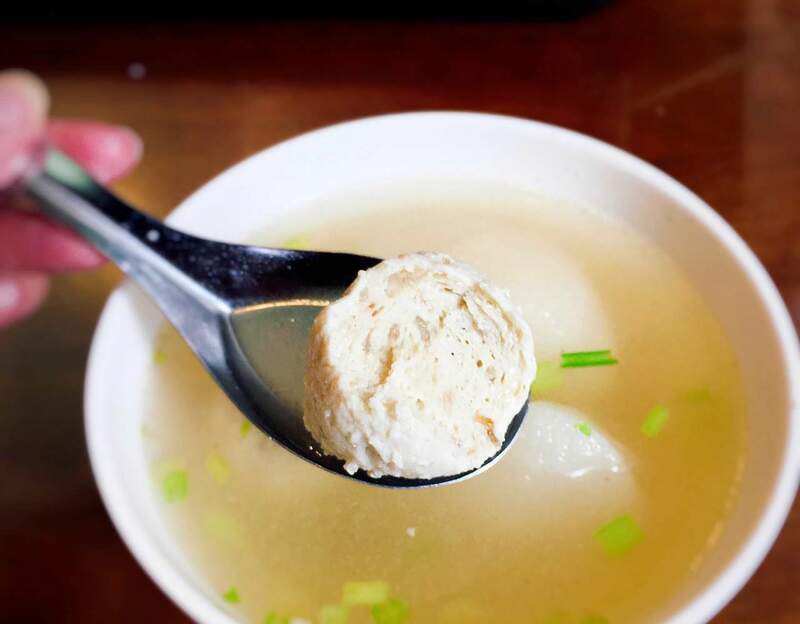 The fish balls’ texture is easy to chew without any seafood flavor. The leek aroma spreads in the mouth when you drink the soup.